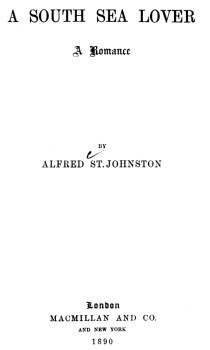 Alfred St. Johnston : Surf-Board Riding, 1890. A South Sea Lover : A Romance. A detailed description of surf-riding in a a work of romantic fiction. canoe-shed where North was at work with his men. It always astonished him to find Christian steadily going on with his boat-building, for a Polynesian, although he can work hard by fits and starts, cannot understand a long-continued effort. Several times since Christian had been in Omeo he had witnessed, and endeavoured to take part in, that noblest of all sports - surf-riding, and he was glad enough to join in it to-day. He left his work, and, like two boys let out of school, he and Soma ran back to the house to get the great polished surf-board. When they got back to the part of the beach where the greatest of the great rollers came swiftly but solemnly rushing on the shore, it was already trampled by the little crowd that had collected there. The place chosen was opposite the opening in the reef, for there the huge waves, unbroken by the coral barrier, came rolling into the land almost mountain high. Surf-riding, besides being the most madly exhilarating of all manly and athletic sports, is one of the most beautiful and exciting to witness; for the players in it, who trust themselves in the midst of such gigantic force, seem so feeble and puny when compared with the strength of the elements they combat with and conquer. in the water; some far out at sea, and others close in shore in the midst of foam and spray, being borne lightly and swiftly along by the racing water beneath them. The swimmers, carrying their light surf-boards with them, enter the foaming water just as a huge roller is about to break, and, diving through the dark green mass of the moving water, they come to the surface for a moment, and swim to meet the next great wave, through which they plunge in the same manner. They have to dive and swim through the roller, for if they were caught on its moving crest they would be carried back resistlessly and dashed upon the beach. They swim in this manner steadily out to sea, sometimes as far as a mile from land, pushing their light boards before them; then, having reached the comparatively smooth water beyond the reef, they wait a moment to choose some great splendid roller on which to launch themselves. Getting on to the very crest of this they throw themselves upon their board, and taking the utmost care to keep the plank at the right angle with the ridge of the wave, they are carried along madly to the shore. It is a sort of wild bird's flight between sea and heaven; the strong wind hurrying them along, and blowing out their wet and tangled hair. 'I must go,' said Soma, his dark eyes flashing with excitement; 'I cannot stay. The wind says to me, "Come out to sea and fly back like a bird." 'Mine is large enough for two. If we can get out I can bring you back. Without more ado the two men put on mahis of sea-weed—as is always done—and, only waiting for the oncoming of a gigantic billow, they plunged into the dark-rushing water. Soma felt Christian close to him in the water, and when they came to the surface they were shoulder to shoulder. Although Christian had many doubts as to his powers as a surf-rider, in which art he was absolutely a novice, it gave him a keen thrill of pleasure to be once more risking dangers with his companion in former perils, and it reminded him very vividly of that night, now long ago, when side by side they two escaped from the ship. There is always a strange sharp feeling of pleasure in knowing that the life one holds so dear is in jeopardy - it accentuates the sensation of living to feel that perhaps one may not enjoy it long; and although the danger that Christian ran was perhaps not very great, as he was with so tried and expert a swimmer as Soma, still it was present enough to his thoughts to add that wild thrill to his heart which he who bears aloft his life in his own hand feels. hair blowing in the wind, which drowned their voices as they gaily shouted some short message to the outward bound. At last they passed through the great gates of the reef, and were out on the open breast of the heaving ocean, with its waves careering in unbroken force and the strength of the wind unchecked. greatest waves which they could trust would roll on with increasing swiftness to the land without a fall or break. It was strange to be so near the land and yet have no glimpse of it; but so it was, for the water ran so high between them and the shore that they could only have seen it from the crest of the waves, and these they had had to dive through. 'Gua mo teu?' (are you ready ?) asked Soma. Almost as he spoke they rose on the wave, and Christian flung himself chest down on the broad smooth plank, whilst Soma, who had not let go of the board, flung himself on the top of him, and gradually and steadily pulled himself up till he had a foot on each side of North, and stood up to his full height. They were safely launched, and the roller carried them swiftly along with a perfectly steady motion that increased in speed as they neared the land. on the reef and again on the shore. North turned and looked up at Soma as he stood above him in all the magnificence of his manly beauty, like Neptune controlling whilst delighting in his subject elements, and his face glowed with a sort of inspiration. amidst all God's elements let loose about them, of which they seemed - so impersonal was the moment - an undivided part. He forgot Utame, he forgot his great love for her, and Soma was as oblivious of all that he held dear. It was one of those times when Christian's sight was as a veil through which facts passed to the vision within and strangely mingled truth with fantasy. As the sea grew shallow the great waves rose higher yet as they rolled upon the land, and it is then that the real danger of surf-swimming begins, for if the swimmers fail to guide their frail barks to a safe, sandy part of the beach, they have to turn and strike out again to sea to avoid being dashed upon the rocks. This decisive moment had now come for Soma and Christian; from the crest of their great roller, which was beginning to curve for its breaking, Soma could see the crowded beach, and he saw, too, that they were being carried upon a low and jagged reef of limestone that in one place jutted up through the sand. 'Hugu koi ma kakau!' (dive and swim back), he shouted to Christian; but he either failed to understand him, or the crashing of the breakers drowned his voice, for Christian did not dive until a moment too late, and he and Soma were torn from the board and swept along like straws in a mill-dam. Blinded in the whirl of waters Christian seemed to lose consciousness, though he turned and tried vainly to swim back; then he felt himself seized by two strong arms, and he was pulled down under the great dim wall of water. The next moment Soma was flung upon the sand, and, with Christian in his arms, staggered out of the back rush of the water. swimmers making a few superhuman strokes the following wave threw them on the beach. breath had chilled their souls. Geoff Cater (2017) : Alfred St. Johnston : Surf-Board Riding, 1890.